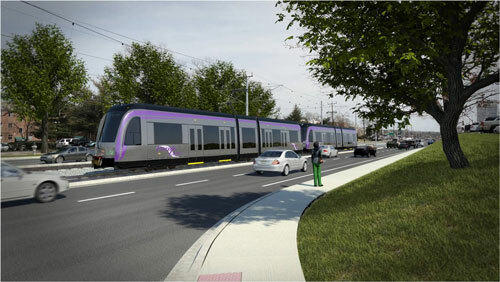 The Purple Line is a proposed 16-mile Light Rail Transit (LRT) line connecting Bethesda to New Carrollton. There are ten stations in Montgomery County, including Bethesda, Connecticut Avenue, Lyttonsville, Woodside, Silver Spring Transit Center, Silver Spring Library, Dale Drive, Manchester Place, Long Branch, and Piney Branch Road. An eleventh station at Takoma/Langley Crossroads is just outside of Montgomery County, but will be used by Montgomery County residents. The light rail line operates partially in exclusive right-of-way (the Georgetown Branch), partially in the roadway in lanes dedicated for transit (University Blvd), and partially in lanes shared with traffic (Wayne Avenue). The Purple Line will be jointly funded by the federal government and State of Maryland, with financing from the private sector. It will be designed, built, operated, and maintained by a concessionaire as part of a Public-Private Partnership.